When it comes to pregnancy tests, you can never be too careful about what you buy. Considering how important the result is, you really can’t afford to get anything but the best. You need a pregnancy test that is easy to use, accurate, and gives readings that are easy to understand. At any given moment, you are sure to come across a number of different products – so, how can you decide which one will work for you? To take all the hassle out of this decision process, we went ahead and reviewed the best tests available. 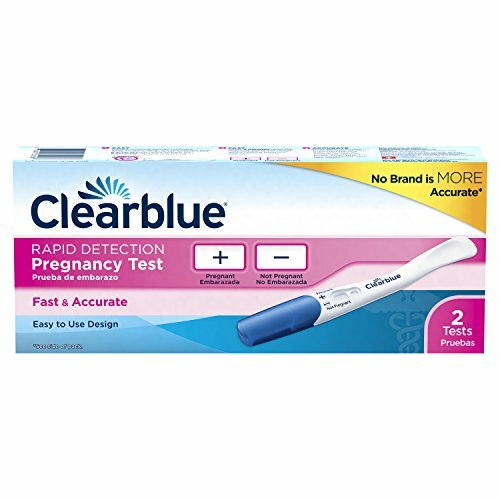 These pregnancy test strips are great for anyone who has been trying to get pregnant for a while and needs to conduct tests often. In this pack, you get 25 individually sealed strips. So, as you can see, it will last you quite a while as you can ensure the accuracy of the readings each time. 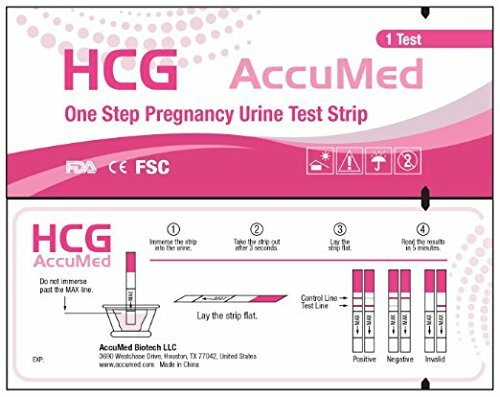 These strips work by detecting the level of hCG present in your urine. Depending on how much the hormone is produced, you can expect to see a light or dark indicator on the strip. Now, these strips are definitely accurate and if you are pregnant (or not), the strips are likely to indicate your condition. They also have a sensitivity of 25 mIU, or 25 ng/L. The downside is that these strips don’t work too well if you are in the extremely early stages of your pregnancy. So, if you are only a few days pregnant, the indicator may be too faint for you to see. There is also the fact that while these strips are easy enough to use, they require a bit of a hands-on approach if you want to use the strip by itself and not get an additional stick. Apart from this, though, the tests give results that you can rely on. This is especially true since they are so easy to read. If you are not pregnant, only one color band appears in the control zone. However, if you are pregnant, color bands will appear in the control and the test zone. This will indicate the test is working and that the result is positive. If you don’t want to wait too long to find out whether you are pregnant or not, this is a good option for you. This test allows you to examine yourself up to 6 days before your missed period. To top it off, this is an incredibly accurate test which means that you can trust the results. The reason this test can provide you with such early results is that it detects four major forms of hCG. So, even if the levels are low – as with the very early pregnancy stages, it can still be detected. You will also be able to tell in about 3 minutes whether you are pregnant or not. It will be no trouble at all, checking the results – one line indicates a negative result while two lets you know that it is positive. It is as simple as that. 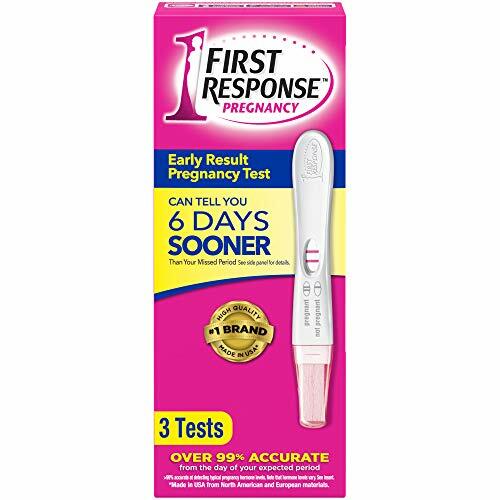 Unfortunately, the only thing that isn’t great about this pregnancy test is the stick and its curved handle. The handle is overly curved which can make it difficult to keep the stick flat while you are trying to use it. Then, there is the question of value. This particular brand is a bit more expensive than others but you get three sticks in a pack for multiple uses. 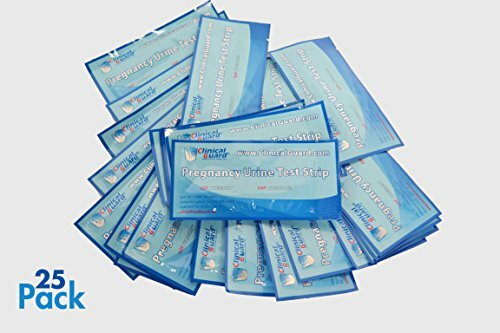 If you need to take a pregnancy test often to check whether you are pregnant, these strips offer you a more economical option. In just one affordable package, you get 25 strips. This way, you can take the test as many times as you want, without wasting money. Of course, it should be noted that these strips have to be immersed in urine for you to get a proper result. So, in this way, it can be a bit tough to use without a pregnancy stick. However, the good news is that it doesn’t take you long at all to find out your results – in about 5 minutes, you should know the answer to your question. The slight caveat here is that these strips aren’t great with early detection. If you use them rather early on, there is a chance that you may end up with a false positive. However, if you use the strips at the right time, they provide highly accurate results. Since these strips have been made so easy to read, it is unlikely that you will make a mistake. If you are pregnant, there will be colored bands in the Control and Test zone. If your test is negative, there will only be bands in the Control zone so that you know the test is working. If you want to start your testing rather early on and don’t want to have to splurge on more expensive tests, then these are the strips for you. This is because the strips are capable of reading hCG levels as low as 25 mIU/ml. So, you should be able to know that you are pregnant up to five days before your missed period. However, you should be warned that these strips do have their limitations. While they can detect a pregnancy in its very early stages, you should note that the reading may be faint and difficult to read. Still, they are an excellent choice for anyone who has been trying to get pregnant for a while. With the 25 strips provided to you, you can take the tests any number of times to get the most accurate results. Using these strips by themselves may be a bit fiddly as you have to immerse them for a short period of time. Fortunately, within a span of five minutes, you should have the answer that you need. The readings are also fairly easy to read – one line means that the test is working but you are not pregnant. Two distinct lines, on the other hand, means that you are pregnant. If you want quick yet accurate results, then this is the pregnancy test for you. Now, to start with, this is definitely one of the easiest tests to use. The handle is curved to just the right amount so that you can hold onto the stick and position it properly. Also, once the tip of the stick is wet enough, it will turn pink, letting you know that the sample was sufficient. After that, it is just a matter of waiting five seconds until you get the results. What’s great about this test is that there are no lines to read – a positive sign indicates that you are pregnant and a negative sign says that you are not. So, there really can be no mix-up. The only issue is that the sign can be fairly faint in certain instances so you may feel the need to do another test to be sure. This can be more likely to happen if you take the test rather early on in your pregnancy. However, you can still expect accurate results as this test allows you to test up to five days before a missed period. The only other minor complaint is that while you get two sticks in the pack, it can still be a tad bit pricey if you want to continue to try the test. Now that you know what the best products are, let’s move onto how you can identify the top pregnancy tests for you. Now, for the most part, all at-home versions work the same. They test the human chorionic gonadotropin hormone which is produced by the placenta and is released into the urine. The level of hCG can typically determine whether you are pregnant or not, and even how far along you are. Tests Using Strips: as the name suggests, these are strips that can detect hCG levels. They are commonly used because they are affordable and available in bulk. They are also quite accurate. The only disadvantage with the strips is that it has to be immersed in urine which can make it tricky to use. Stick Tests: in many ways, the stick is rather similar to the strip. The only real difference is that the stick can be held under a stream of urine and as a result, can provide you with faster readings. Not to mention, this also makes them easier to use. These, too, are accurate but are more expensive than the strips. Digital Tests: while digital tests also rely on strips, you don’t have to do any of the heavy lifting Instead, it is just a matter of waiting for a clear, digital reading after taking the test. While these are simpler to use and read, they aren’t always accurate. These tests are also a bit more expensive than the other options. Among pregnancy tests, you will find that some allow you to test your hCG levels even before a missed period. In most cases, these tests allow you to discover whether you are pregnant or not up to six days before. These often work by being able to determine much lower levels of hCG. So, the question remains, should you trust these tests? There are early detection tests that do work but you should be aware of their limitations. For instance, you may be more likely to get a false positive or negative at this stage. Also, the readings may not be as strong as you would like them to be. It is often best to take to take the test a few days after a missed period. This way, the chances that the results will be accurate increase to 99 percent. Now, as mentioned, all of these home pregnancy tests detect hCG in your urine to determine whether you are pregnant or not. However, they do tend to differ in just how sensitive they are. In most cases, you will find that most home tests are between 25 mIU and 100 mIU. If you want the most accurate results, you should go with a test that is as sensitive as possible. This way, it will be able to detect even lower levels of the hormone. Therefore, you will get a stronger result and can be a lot more certain of its accuracy. Now, each pregnancy test shows you the results in a variety of ways. Some show a varying number of lines while others show + or – signs. In the end, it is what you find easiest to read. Now, the tests with the lines are often the least expensive options. However, they can be a bit tricky to understand, if you aren’t familiar with the way they work. See, in these instances, one line means that the test is working but you aren’t pregnant. It is only when you see two lines that the result is positive. While the + or – signs are a lot easier to grasp, these tests are often a bit pricier. Then it is a matter of how long you are willing to wait to figure out whether you are pregnant or not. There are some tests that take just a few seconds while others can take several minutes. There isn’t any correlation between the time taken and accuracy in these instances so it really is up to you. Easy handling: you should think about how squeamish you are when it comes to taking the tests. If you are looking for a test with minimal fuss, then consider the stick versions. Brand names: it is best to stick with brand names as opposed to generic tests as you are more likely to get an accurate reading. Multiple uses: if you either want to take an early test or want a more accurate reading, you should get tests that come with multiple sticks or strips. This increases the precision of your final reading. To summarize, look into the type, sensitivity, result format, and time taken when figuring out the best pregnancy test for you. If you want to take the earliest possible test, then you should consider the First Response or Clear Blue tests. However, if you are looking for the most economical options, the ClinicalGuard and AccuMed pregnancy strips are best. 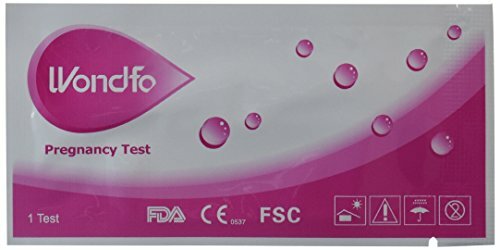 For quick results, the Wondfo strips will serve you best. Now you know which pregnancy tests are best for you and even how to go about choosing one.